Progress! Lets keep it going. I, Der H, do hereby pledge to complete my Dreadclaw drop pod for my IIIrd legion! I, Brother Handro, lacking time and Tau HQ choices this month, do hereby pledge to complete Aun'Shi AKA Tau Rambo...Tau'Mbo, if you like. Lucius now has the base purple and the first shade. Just needs a final zenithal highlight after a wash and then I can start blocking out the other colours. Given the corrupted look of his armour I am likely to go relatively simple on the colour scheme in terms of the brightness of the pinks. Perhaps some pearl/white panels and some silver/platinum sections to denote veteran status.....and obviously the skin chest plate! Good lord, there is life in the basement yet! Well it’s another slow month - largely because I’m spending a lot of time working on my 1989 Landrover 110....bit of a time pit! However there is some progress; Lucius is built and primed, as is the dreadclaw! In addition, I have another project in the works - 6 Legion Jetbikes! 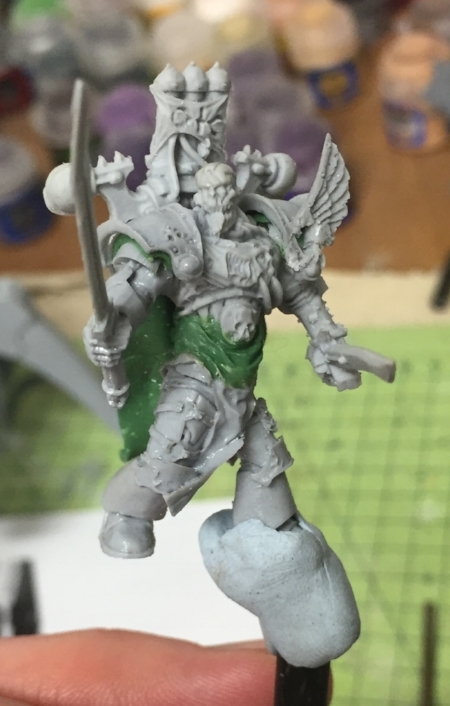 So far, one is built as a Sgt with Phoenix spear, with the rest standard with some IIIrd legion upgrade parts. All of the weapons are pinned, so I’m looking forward to switching this between FA & HS slots!